With Black Friday and Cyber Monday behind us, now’s the time to make that big push that will result in the strong finish we’ve all been planning for all this year. And because you’ve been making complex plans around holiday for months now, the truth is there’s only so much you can change in the remaining weeks we’ve got here. So today’s advice isn’t about products you should have been carrying or the technology you wish you’d have pulled the trigger on back in March, rather it’s about the calibrations and quick decisions that can incrementally improve your performance and provide learnings and insights both for now and for later. One tip from us to you: we’ve provided the data on how discounting and promotions looked during Cyber Week which lays the groundwork for some of the themes for today. I knew I wasn’t being crazy in stalking the every move of my online orders. Raise your hand if you also keep one window open in your browser and refresh a few times a day, awaiting the dreaded delay or missed delivery notification. Well it turns out, research from LateShipment.com shows that 12-16% of clothing orders last year delivered by UPS and Fedex, were subject to delays. (And, yippee, it’s worse if you live in a major urban area. ) I feel vindicated by this data, but only partly, because my stuff still hasn’t arrived. As the retailer, it’s not really your problem, right? 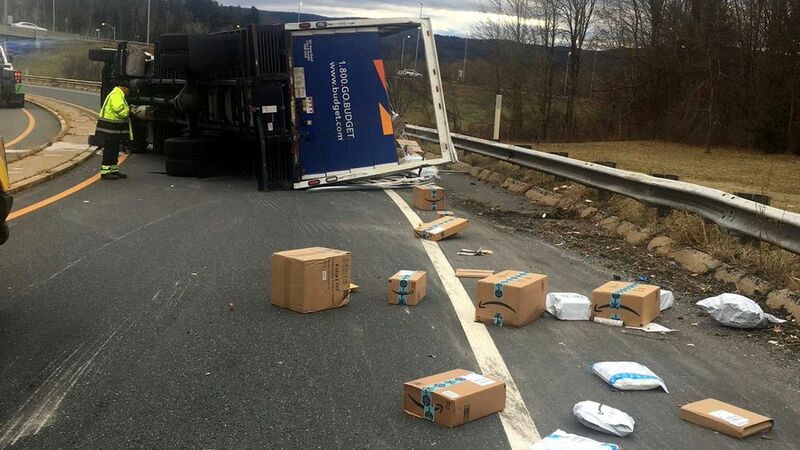 Well, unfortunately the customer isn’t always going to go through the effort of separating who is and isn’t to blame when it comes to delayed shipments. So with that accountability threat hanging over your head, we’d like to make the case that maybe you could do a little something to appease that irritated shopper. One, give them a heads up, and not just in the fine print of their order confirmation, that delays are happening because of weather, order volume, (you fill in the blank). And here’s an even more revolutionary idea - how about offering them a free shipping or token discount for a post-holiday purchase when it happens? Remember this is a shopper you want to court year-round, not just at holiday. Do I Really Need To Hear From You More Than I Do My Mom? We have a love-hate with our inbox when it comes to promotions. Sure, we take advantage of some of those great deals, but once the unread email count balloons to over a hundred in the course of an hour, we employ the mass delete function and shift over to Instagram for a little calm in all that frenzy. With our data showing that we’re sometimes getting 3 emails a day from certain retailers, it starts to border on the excessive and unfortunately for the retailer, unseen. While only you know the data on who opens and what they click on, we’d like to make the case for being as personal, thoughtful, and measured as you can be in the remaining weeks of your holiday promotional calendar. We mentioned it before, but Instagram, through the power of visual and video content, has a way of being less over-bearing and more organic when it comes to promoting your brand. Consider, over the next few weeks, whether a slight rebalance in your promotional channels might be just what the agitated and stressed holiday shopper needs. Here’s Some Things You Don’t Have To Discount! Listen up, because this is an important one, and one that you can exercise some control over starting right now. There’s actually some stuff that isn’t on sale. Do you happen to know what it is? Well, let us enlighten you as to where you can hold back on discounting and still be competitive in this holiday market. This year some of the least discounted categories we’re seeing are bags - and the category as a whole is really holding its own. 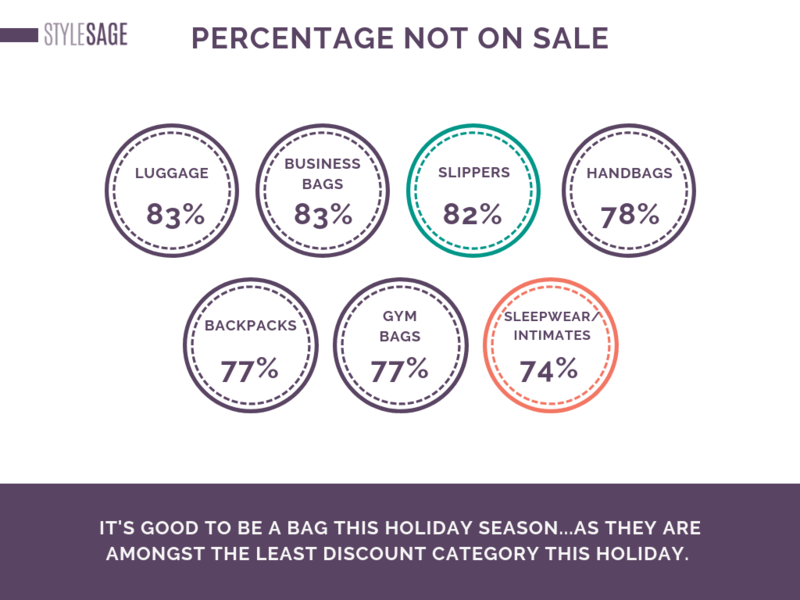 Less than a quarter of retailers’ bag assortment is on sale. Check out the visual below to understand just how low they are. We’d say now’s a good time to see if your discounting stacks up with that. Have more questions about finishing strong this holiday season? Get a copy of our holiday webinar right here. Elizabeth Shobert — A certified retail nerd. What's The Deal With Cannibalization?